Marchionne on Apple: "If they have any urges to make a car, I'd advise them to lie down and wait until the feeling passes." 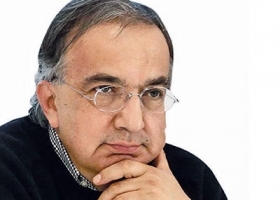 GENEVA -- Fiat Chrysler Automobiles CEO Sergio Marchionne, who describes himself as an "Apple freak," is keen to partner with the technology giant on building a car. Given the complexity of auto manufacturing, Apple Inc. would be better served working with an established manufacturer than trying to build a car on its own, and FCA would be well-suited, according to Marchionne, who says he owns every kind of product Apple makes. "I would assume that we have the credibility to be one of the players they have looked at," Marchionne said at the Geneva auto show. "There are parts of us that would be interesting for them." He also said of Apple: "If they have any urges to make a car, I'd advise them to lie down and wait until the feeling passes. Illnesses like this come and go, you will recover from them, they are not lethal." A source told Reuters last year that Apple was exploring how to make an entire vehicle, not just designing automotive software or individual components. Helping a competitor get off the ground may seem an usual move, but it reflects Marchionne's belief that the auto industry wastes capital and needs to change. His latest push for consolidation has been rebuffed by counterparts, and Marchionne has shifted focus to eliminating Fiat's debt and boosting profit. A partnership with Apple, or Google, could help that. While Google has been testing driverless vehicles, Apple has been exploring the development of a car and pushing a team to begin production of an electric vehicle as early as 2020, people familiar with the effort have said. Marchionne says he understands Apple's "syntax" and is ready work on their terms, putting Fiat Chrysler in better position than rivals. "Apple has a language, and you have to be able to speak that language," said Marchionne. "Usually the industry comes into that dialogue with a high degree of arrogance as we know how to make cars. That's not very helpful as their syntax is worth more than our ability to build cars."